America’s most wanted, hard-to-win automotive honor, the coveted “Car of the Year” Award from Motor Trend Magazine, goes to Rambler ’63 over all other cars. Big reason: a whole host of new and major Rambler features that are available in no other cars. Most Important improvement is anew Advanced Unit Construction in Rambler Classic and Ambassador – a years-ahead breakthrough in car building. It provides vastly increased strength and solidity in cars with full room for six 6-footers – plus amazingly easier entrance and exit, with curved glass side windows that permit doors to curve into the roof. A new development in power transfer – Tri-Poised power – brings a new velvety smoothness at all car speeds. 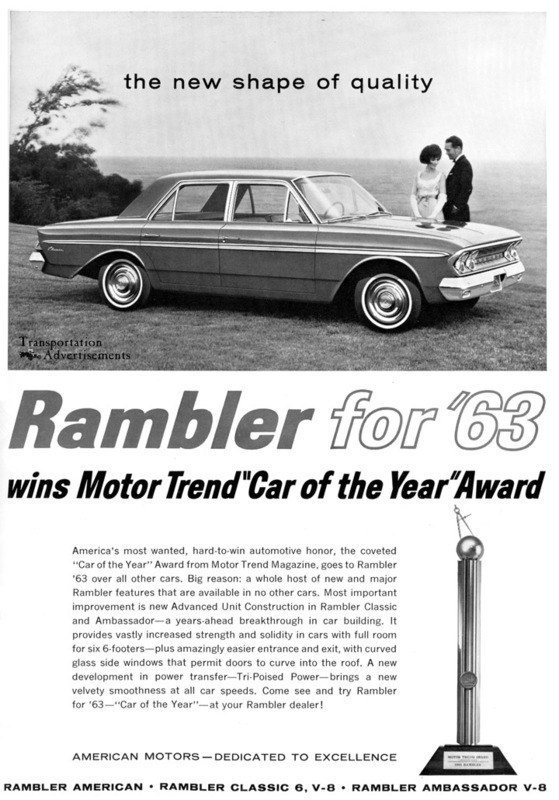 Come see and try Rambler for ’63 – “Car of the Year” – at your Rambler dealer!